The fine balance between performance and control that every supersport motorcycle strives to achieve reaches its pinnacle in the new 959 Panigale. 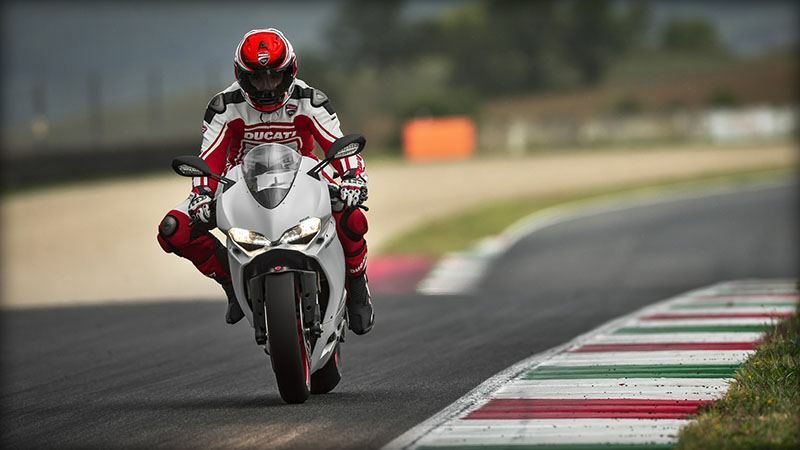 All combined in a unique design, which hallmarks the bike as an immediately recognizable member of the Ducati Superbike family. Lightweight and ready to thrill, thanks to its new 955 cc Superquadro engine and exclusive monocoque frame that ensure great handling and precision control. High level componentry such as a Brembo monobloc braking system with Bosch ABS, a slipper clutch, a Showa BPF fork and fully adjustable Sachs rear monoshock, and Riding Modes and Ducati Quick Shift all provide maximum control and safety. ARCHITECTURE: The engine has been designed as a structural element of the frame. As such, its architecture has been completely reviewed to ensure the best design in terms of structure, weight distribution and robustness. The cylinders, at a 90° angle to each other, are mounted on the crankcase to produce a 21° angle between the front cylinder and the horizontal plane. This allows the engine to sit forward, optimizing the distribution of weight between the front and rear ends and achieving the perfect position of the fastening points of the cylinder heads into the monocoque chassis of the 959 Panigale. ESSENTIAL DESMO: During the Superquadro's development the need to control large valves with the extremely precise Desmodromic system prompted engineers to replace the belt drive of previous Superbikes, mounted on the first Ducati Pantah in 1979, with a configuration mixing both chain and gears. This chain drive efficiently synchronizes the crankshaft and camshaft, and thanks to an automatic tensioner, ensures constant reliability and a reduction in routine maintenance costs. 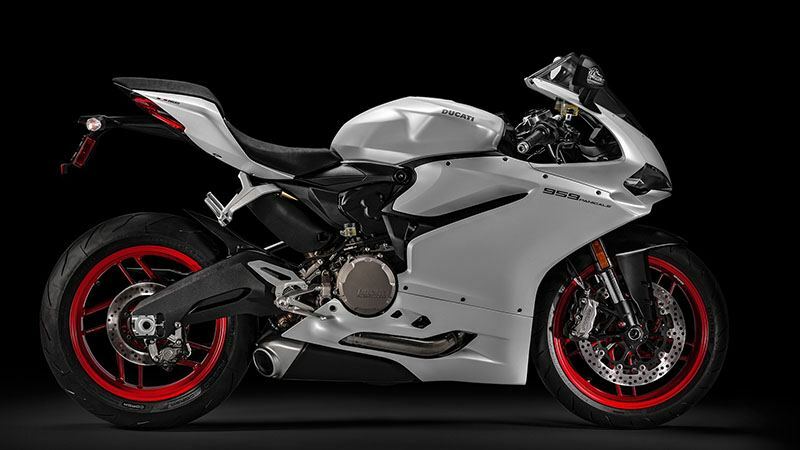 FLAWLESS PERFORMANCE: The Superquadro is the most potent twin-cylinder engine on the planet, and in the 959 Panigale it produces a fantastic 157 hp* @10,500 rpm, and 107.4 N-m of torque @9,000 rpm. And thanks to the sweet nature of the L-twin, and Riding Mode options, the rider is able to easily modulate this tremendous power and tailor it to his riding style and road conditions. *The power values indicated above are measured using a chassis dynamometer. Homologated power data, as quoted in the Bike Registration Document, are measured using an engine dynamometer according to the homologation regulation. The two power values may differ because of the different measurement equipments. TRANSMISSION: The 959 Panigale features an advanced six-speed transmission with large diameter gears for superior strength. Perfectly controlling the power put to the ground is a hydraulically actuated multi-plate wet clutch, which has back-torque limiting "slipper" functionality to prevent hopping of the rear wheel during aggressive downshifts. With smooth engagement, superb feel, and light effort at the lever, the 959's clutch helps keep the bike in perfect balance on the street and the track. FULL RIDE BY WIRE: The opening and closing of the throttle bodies on the Superquadro are controlled electronically in a system called Ride by Wire. The absence of a mechanical connection between the twistgrip and the throttle bodies allows the engine ECU to regulate the power delivery by acting upon the throttle's opening angle; Ride by Wire makes it possible to have different power and delivery based on the selected Riding Mode (Power Modes), and also to manage engine braking (EBC), as well as allowing the implementation of traction control (DTC). SUPERQUADRO BREATHING: After achieving the goal of improving engine "breathing", the Superquadro engineers turned their attention to the next challenge: to attain an engine calibration that optimally combines the high-performance delivery with regular operation achieved by reducing the cyclic dispersion of combustion. To obtain this, Ducati introduced a system of secondary air injection that completes oxidisation of the unburnt hydrocarbons, effectively reducing the levels of carbon dioxide and carbon monoxide (CO). The system is controlled by an electronic valve commanded by the engine control unit and is activated according to the specific condition of engine operation. This valve makes it possible to let in the exhaust pipe of each cylinder head (in a position slightly downstream of the exhaust valve) a flow of clean air originating directly from the airbox. A second reed valve located in the engine head makes this flow unidirectional. The controlled inlet of oxygen makes it possible to complete the combustion of outgoing hot gases, eliminating eventual fractions of unburnt fuel which in certain conditions can reach the exhaust. DECOMPRESSOR: At the extremity of the exhaust camshaft of each cylinder head is a centrifugal decompressor. On start-up, the device allows the profile of the cam opening lobe to be modified, resulting in a slight lift of the valve that discharges part of the mix contained in the combustion chamber during the engine's compression phase. This effect makes it possible to reduce the resistance to the motion of the piston in the compression phase. Once the engine is started, the increase in rpms and the relative centrifugal force modify the configuration of the device, cancelling the effect of the valve lift and bringing the engine back to normal operating conditions. This ingenious device facilitates the starting of the Superquadro engine without having to use a more powerful battery and a large starting motor, in turn making it possible to reduce the overall weight of the vehicle by 3.3 kg. The system further underlines the synergistic strength achieved by engineers and designers in the intense effort to reduce the bike's weight. EXTREME BORE/STROKE RATIO: The 959 Panigale's extremely oversquare bore/stroke ratio of 1.64:1 (100 mm bore/60.8 mm stroke) allows for reliably high rpm thanks to the ultra-short stroke of the crankshaft, while the large surface of the pistons allows for large valve diameters (41.8mm intake, 34mm exhaust) to let the engine breathe freely. MONOCOQUE TECHONOLOGY: The 959 Panigale's chassis follows the innovative Monoscocca concept: different components have been integrated to give shape to a single compact and lightweight element. This monocoque structure in cast aluminium for increased strength uses the Superquadro engine as a structural element, forming the motorcycle's lightweight core. The rear of the monocoque frame is fixed directly to the cylinder head, and at its front is the steering tube. In addition to performing the traditional function of a frame,the monocoque also acts as an airbox. Housed inside it, in addition to the air filter, are the throttle bodies and fuel circuit complete with injectors; and the bottom of the steel tank becomes its cover when mounted in place. INNOVATIVE SUSPENSION: As on the 1299 Panigale, the 959 Panigale's fork legs are set at a distance between centres typical of racing bikes in the Superbike World Championship. Thanks to this detail, the brake discs have space to allow optimal cooling even during the hardest use. The 959 Panigale features a 43mm Showa Big Piston Fork, which provides damping under lower-pressure conditions as compared to a traditional fork. This gives optimal front-end feeling to enter corners with the utmost precision, with high resistance to diving when the brakes are applied. The rear suspension consists of a fully adjustable Sachs rear monoshock, laterally mounted for ease of adjustment access and connected via progressive linkage for the best rear suspension response under road and track conditions. 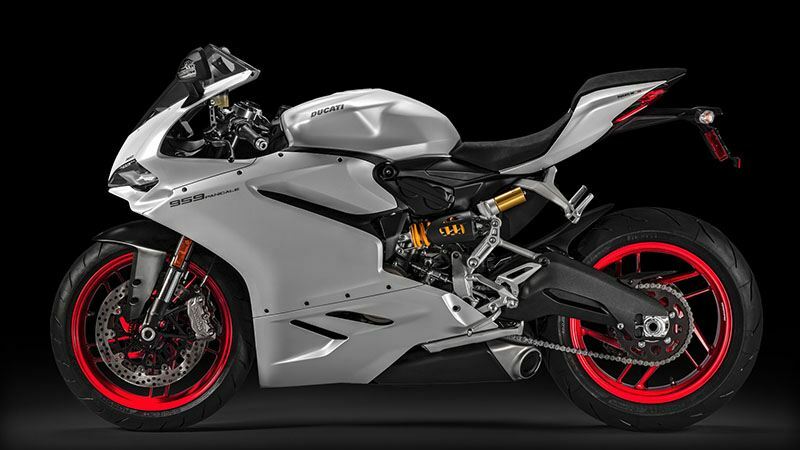 EXHAUST SYSTEM: The 959 Panigale features a new, lateral "cannon" style exhaust with twin aluminium silencers, which complies fully with Euro 4 regulations. A stainless steel pre-silencer sits under the engine, keeping the weight of the catalyzer close to the bike's central axis for optimal handling. BRAKING SYSTEM: The 959 Panigale is equipped with staggeringly powerful - yet not overwhelming - Brembo Monobloc M4.32 front brakes operating on 320 mm front rotors, which come standard with the latest-generation Bosch 9MP Antilock Braking System. This enables the shortest possible braking distances even in wet or dirty road conditions, while also controlling rear wheel lift to provide maximum braking stability. Specifically calibrated for sport riding, the system features 3 intervention levels, each associated with a Riding Mode. In Race Mode, the system operates only on the front discs to allow advanced race-braking techniques on the track. 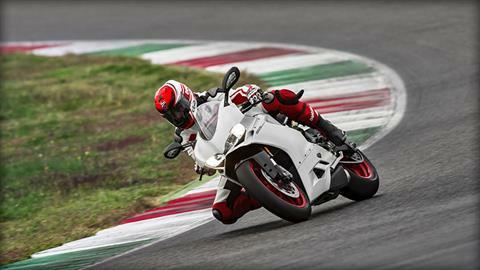 ERGONOMICSS: The 959 Panigale has been ergonomically designed for a perfect integration between rider and motorcycle. A comfortable seat, narrow width, grippy machined footpegs, and carefully placed handlebar location provide the perfect position from which to command the bike with confidence and precise control, on the track or the street. 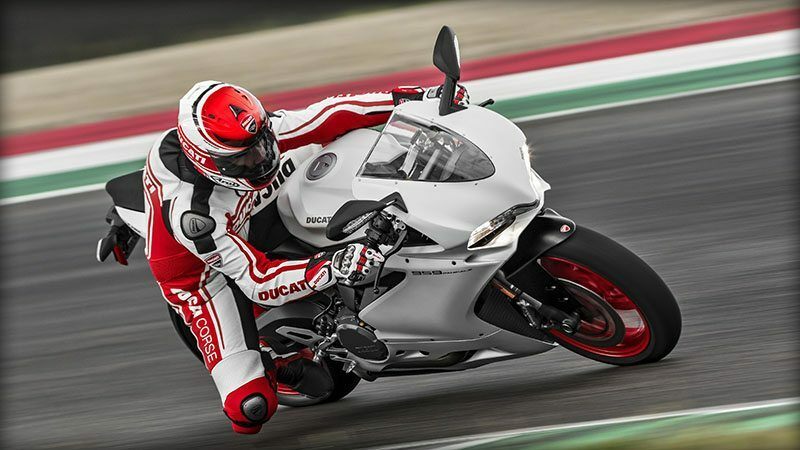 WEIGHT DISTRIBUTION: The 959 Panigale features a weight distribution equivalent to 52% at the front and 48% at the rear without the rider or fuel. Fully fueled and with the rider, this becomes a perfect 50:50 balance to guarantee absolute stability and handling. To achieve this distribution, placement of the engine, exhaust, and rider were carefully evaluated and determined. ABS (ANTI-LOCK BRAKING SYSTEM) 9MP: The Bosch 9MP ABS standard on the 959 Panigale is a latest-generation system with two channels that performs combined braking with control of rear wheel lifting to guarantee not only shorter braking distances, but also the greatest stability during braking. Specifically intended for sport use, the 9MP ABS offers three levels of operation, each associated with a Riding Mode; in the Race mode, the system works only on front discs to allow advanced track braking techniques for expert riders. FULL LCD INSTRUMENT PANEL: The instrument panel on the 959 Panigale is an advanced multifunctional LCD unit, with layout derived from Ducati Corse's experience in World Superbike and MotoGP. Showing a vast array of information in a format highly visible even when tucked behind the windscreen at maximum velocity, the dash also changes its display according to the riding mode selected - ensuring that the rider always has the most important information for each use, available at a glance. RIDING MODE: The available Riding Modes are the result of the combination of highly advanced dedicated technologies. The rider atop the 959 Panigale can choose among three different pre-set Modes - Race, Sport, and Wet - to adapt to his riding style or the riding conditions. The Riding Modes instantly modify the power delivered by the engine (Power Mode), ABS activation level, DTC, DQS and EBC, as well as the graphics on the instrument panel. Additionally, each Riding Mode is fully customisable in all parameters, for a truly personalised setting. DUCATI QUICK SHIFT (DQS): The Ducati Quick Shift (DQS) is the electronic system that manages the gearbox and is used in competitions. 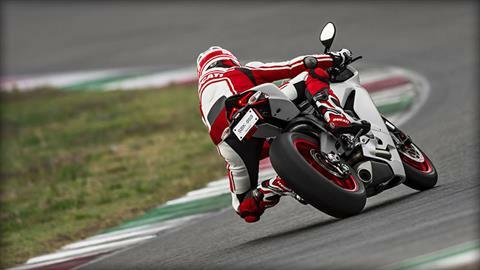 It allows the gear to be engaged on acceleration without the use of the clutch and while maintaining the throttle open. The feature enables the rider to gain precious fractions of seconds, helping to considerably reduce lap times. TYRES: The 959 Panigale features Pirelli Diablo Rosso Corsa tyres, in 120/70 (front) and 180/60 (rear) sizes. The Diablo Rosso Corsa is a reference in the segment of hypersport tyres, developed directly from World Superbike technologies and featuring an optimised contact patch as well as advanced 3-compound construction to ensure quick warm-up, long life, and above all maximum traction available in every circumstance. 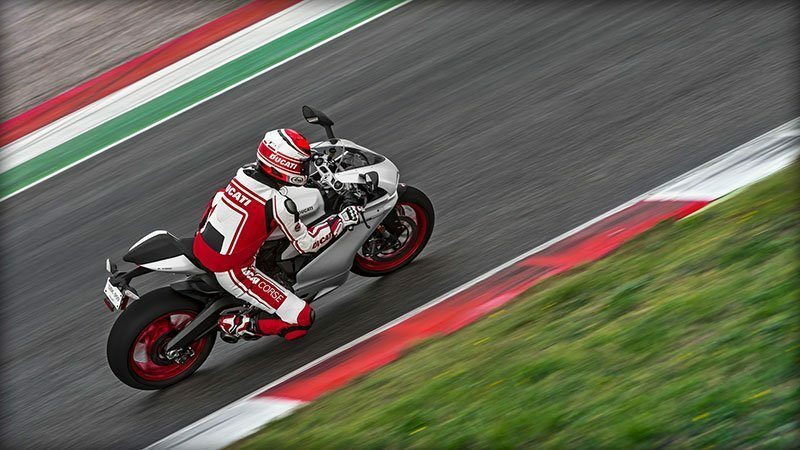 DDA+ READY: The DDA+ (an option on the 959 Panigale, 1299 Panigale, and 1299 Panigale S; standard on the Panigale R) is the latest generation of the Ducati Data Analyzer, which integrates a GPS signal to create a "virtual finish line". The system automatically detects, without any intervention by the rider, the conclusion of the lap and stops the chronometric time. Integration with the GPS signal also provides visualisation on the circuit map of the trajectories ridden and the main parameters of the vehicle: throttle opening, speed, rpm, gear engaged, engine temperature, and DTC activation. RIMS: The 959 Panigale uses black 10-spoke wheels, 3.5 inches wide in the front and 5.5 inches wide in the rear, which due to their light weight allow rapid changes in direction and excellent performance both during acceleration and braking. TRANSFORM AND PERFORM: On or off the track, you can transform your Superbike with two exclusive packages offering a host of high-performance accessories in tune with your needs. Turn your Superbike into the ultimate racing model with specific high-tech components or add features that will improve your experience when touring. Sport and Touring: choose one or both packs to complete the ideal set-up for your motorcycle. These Packages are offered at an additional cost. SPORT PACK: Unleash the power. Make every detail count in terms of performance. Benefit from ultimate technologies in this selection of race-bred accessories. Maximise your experience with specially conceived, ultralight componentry and design elements which enhance the streamlined looks. The package includes carbon fibre covers for the ignition switch and rear shock absorber, an adhesive carbon tank protector, a carbon sprocket cover kit, carbon heel guards for the rider footpegs, an aluminium fuel cap and a carbon and aluminium alloy number plate holder. Black handlebar weights are also included. These Packages are offered at an additional cost. TOURING PACK: Take to the road. Feel safe and comfortable whatever your destination is. Enjoy the ride with a carefully chosen series of premium quality features designed to provide you with maximum convenience and peace of mind. The package contains a water radiator protection grid kit, an anti-theft system, a rider comfort seat ideal for longer distance trips and soft tank bag. These Packages are offered at an additional cost. Front - 10-spoke light alloy 3.50 in. x 17 in. Rear - 10 spokes light alloy 5.50 in. x 17 in. 2 - 1 - 2 system with catalytic converter and 2 lambda probes. Twin stainless steel mufflers with aluminum end caps. Front - Fully adjustable Showa BPF fork. 43 mm chromed inner tubes. Rear - Fully adjustable Öhlins TTX36 unit. Electronic compression and rebound damping adjustment with semi-active mode. Adjustable linkage - Progressive/flat. Aluminum single-sided swingarm.